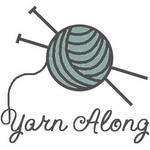 Today I am joining Ginny for Yarn Along over at small things . If you're in the sharing mood, link up with her and others to share what you have been creating and reading this week. There has been a dearth of knitting in my life lately. I have been adjusting to or attempting to adjust to the new routines around here. Between the homework crunch, seemingly constant meal prep, forms, computer business, and toting children around, the needles have been fairly silent. This is not good for me or for my planned Christmas gift list. So yesterday towards the end of a homework project activity and in the middle of a yowling toddler, I set the timer for ten minutes. I told the little people around me that I would be knitting in relative peace until the timer went off. I told them I did not even want to hear the sound the letter "m" makes, lest I think someone is calling "Mama" yet again. Strangely they cooperated. Maybe it was the desperate, kind of wild look in my eye. Even the baby stopped whining as I sat. Seems knitting calms everyone's nerves. I think I will try this again when everyone is off-center and see what happens. Oh but anyway, the title of this post is "Preparing for Autumn", so let's get on with the books shall we. Yes I have been fighting it, but the equinox is Friday so it's time to be at peace about it and enjoy. I have been reading more about Tasha Tudor. Boy was she ever a spitfire-whoa! I picked up The Art of Tasha Tudor from the library. Love this book and hearing about her challenging and interesting personality. Who knows what would have become of her if she hadn't been so determined. I do adore how she marked the seasons and noticed the little changes from one to another. We are also reading Pumpkin Moonshine, and An Autumn Story. That's enough to set the mood for the coming crisp days and warm soup.